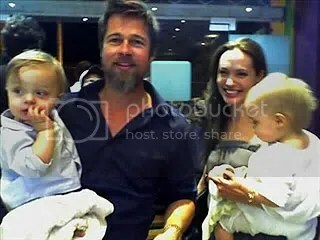 While visiting Amman in Jordan, actors Brad Pitt and Angelina Jolie took twins Knox Leon and Vivienne Marcheline, 14 months, to Licky Licious for an ice cream. The pair are also parents to Maddox Chivan, 8, Pax Thien, 5, Zahara Marley, 4, and Shiloh Nouvel, 3. This entry was posted in Dad and Baby Photos, Mum and Baby Photos, Twins. Bookmark the permalink.